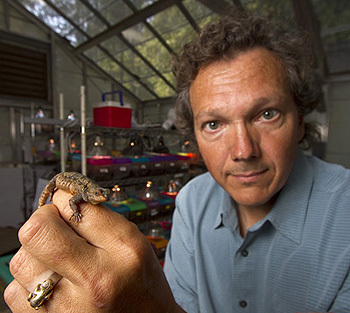 Biologist Barry Sinervo holds a pregnant mesquite lizard, one of the species he is studying in his lab at UC Santa Cruz. Some local populations of mesquite lizards in Mexico have gone extinct due to rising temperatures. Photo by Jim MacKenzie. 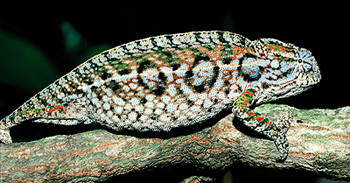 Madagascar is a hotspot of extinctions, where 21 percent of local lizard populations have disappeared. 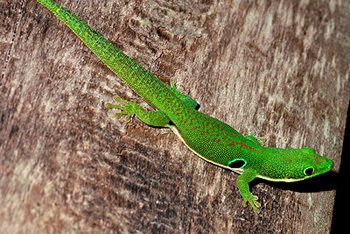 Extinctions there are affecting species in five lizard families, including geckos (such as the peacock day gecko, above) and chameleons (such as the jewelled chameleon, below). Photos by Ignacio De la Riva. A major survey of lizard populations worldwide has found an alarming pattern of population extinctions attributable to rising temperatures. If current trends continue, 20 percent of all lizard species could go extinct by 2080, according to Barry Sinervo, professor of ecology and evolutionary biology at the University of California, Santa Cruz. Sinervo led an international team of biologists who conducted the study, published in the May 14 issue of Science. The researchers surveyed lizard populations, studied the effects of rising temperatures on lizards, and used their findings to develop a predictive model of extinction risk. Their model accurately predicted specific locations on five continents (North and South America, Europe, Africa, and Australia) where previously studied lizard populations have already gone locally extinct. "We did a lot of work on the ground to validate the model and show that the extinctions are the result of climate change," Sinervo said. "None of these are due to habitat loss. These sites are not disturbed in any way, and most of them are in national parks or other protected areas." As local populations continue to disappear, species extinctions will follow, he said. "Most of these species currently registering local extinctions will be completely extinct by 2080, unless we change and limit the carbon dioxide production that is driving global warming," he said. The disappearance of lizard populations is likely to have repercussions up and down the food chain. Lizards are important prey for many birds, snakes, and other animals, and they are important predators of insects. "We could see other species collapse on the upper end of the food chain, and a release on insect populations," Sinervo said. Biologists have also documented dramatic declines and extinctions of amphibian populations around the world, leading to estimates that one-third of amphibian species are at risk of extinction. But Sinervo noted that amphibian extinctions are attributed mostly to the spread of a deadly fungal disease, with a possible indirect link to environmental factors such as global warming. "Our research shows that the ongoing extinctions of lizards are directly due to climate warming from 1975 to the present," he said. A herpetologist known for his research on evolutionary patterns in lizard populations, Sinervo began studying extinctions after noticing a disturbing trend in recent years. When he and colleague Donald Miles of Ohio University went looking for populations that other researchers had studied in the 1980s and 90s, they found that many had disappeared. This happened first in France, where they worked with French researchers Benoit Heulin and Jean Clobert, and later in Mexico, where they worked with Jack Sites of Brigham Young University and Mexican herpetologist Fausto Mendez de la Cruz. In Mexico, Sinervo, Mendez de la Cruz, Miles, and their students resurveyed 48 species of spiny lizards (Sceloporus) at 200 sites where the lizards had been studied between 1975 and 1995. They found that 12 percent of the local populations had gone extinct. To investigate the link between these extinctions and temperature, the researchers went to a site on the Yucatan Peninsula where Mendez de la Cruz's student Norberto Martínez had observed populations of the blue spiny lizard (Sceloporus serrifer) declining over the course of his Ph.D. research. After building a device that would mimic the body temperature of a lizard basking in the sun and record the temperatures on a microchip, they set the devices in sun-exposed sites for four months in locations with and without surviving populations of blue spiny lizards. "The results were clear," Sinervo said. "These lizards need to bask in the sun to warm up, but if it gets too hot they have to retreat into the shade, and then they can't hunt for food. At the extinct sites in the Yucatan, we found that the hours per day they could be out foraging had collapsed. They would barely have been able to emerge to bask before having to retreat." Sinervo used these findings to develop a model of extinction risk based on maximum air temperatures, the physiologically active body temperature of each species, and the hours in which a lizard's activity would be restricted by temperature. In comparing the model predictions with observations in Mexico, the only differences were in cases where a population was eliminated sooner than expected due to competition from a species that expanded its range because it was adapted to higher temperatures. The researchers found that climate change is occurring too rapidly for lizards to compensate with physiological adaptations to higher body temperatures. "We thought we'd see evolution occurring in response to climate change, but instead we're seeing extinctions. Beyond a certain point, the lizards can't adapt," Sinervo said. "We're predicting 40 percent of local populations will go extinct, and that will translate into roughly 20 percent of species going extinct by 2080." From climatologists, the researchers were able to get extremely detailed maps of maximum daily air temperatures over the entire planet in the past and present, as well as projections for the future based on climate models. To validate the extinction risk model, the U.S., French, and Mexican teams enlisted the help of colleagues around the world to provide data on local extinctions, working with researchers in Argentina, Brazil, Chile, Peru, South Africa, and Australia. Sinervo and Miles also conducted "virtual field expeditions" using Google Scholar and Google Earth. "We would search on registered local extinctions and map them," Sinervo said. "Miles immediately found a massive wave of extinctions sweeping Madagascar, which the model had already targeted as an ecological disaster in the making." The climate projections used to model extinction risks assume a continuation of current trends in carbon dioxide emissions from human activities. Many of the extinctions projected for 2080 could be avoided if global efforts to reduce emissions are successful, but the scenario for 2050 is probably inevitable, Sinervo said. "The extinctions are happening really fast. I'm watching new populations go extinct every year," he said. Funding for this study included grants from the National Geographic Society, National Science Foundation, UC Mexus, UC Santa Cruz (Committee on Research grant), the French National Center for Scientific Research (CNRS), the Mexican National Council on Science and Technology (CONACYT), the Australian Research Council, and research councils in Argentina (CONICET) and Spain (SMSI).